There were three variants of the rocket’s second stage planned: a Spaceship, Tanker and Cargo Lifter. The primary of which, the BFR Spaceship, was also the colonization vehicle and that could carry up to 100 passengers and a hundred tonnes of cargo. One possible use of the Spaceship was as the world’s first hypersonic passenger transport vehicle, which would enable travel between any two points on Earth in under an hour. Its primary envisioned mission, however, was to be a colonization vehicle for the Moon, Mars and beyond. The Spaceship would be propelled by four vacuum optimized Raptor engines, feature a heat shield for atmospheric reentry, and land on the Earth and Mars via two Raptor booster engines and four extendable landing legs. To enable the BFR Spaceship to make it to Mars, it would be refueled in orbit by multiple flights of a similarly sized Tanker, which would be an alternate second stage for the booster. Once fully refueled, the Spaceship would make the burn for Mars and sustain the crew over the multi-month journey. At Mars it would enter the atmosphere, slowing down via a combination of drag and retro propulsion so as to safely land. Once unloaded, the Spaceship would be refueled using local resources, specialized equipment and the Sabatier reaction. It would then launch back to Earth, where it would touch down upon land not far from its launch pad. A Cargo Lifter version of the Spaceship would also be designed to launch satellites into orbit and resupply manned space stations around the Earth. 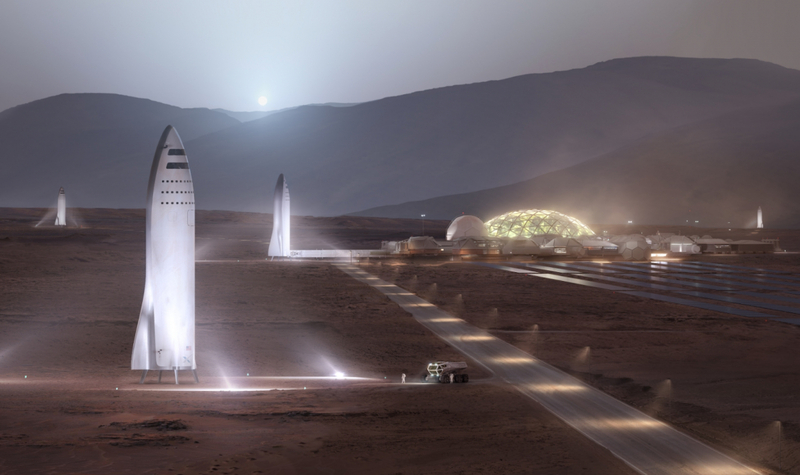 This would allow the BFR to entirely replace the SpaceX Falcon 9 and Falcon Heavy rocket family, albeit with vehicles of a much greater scale. 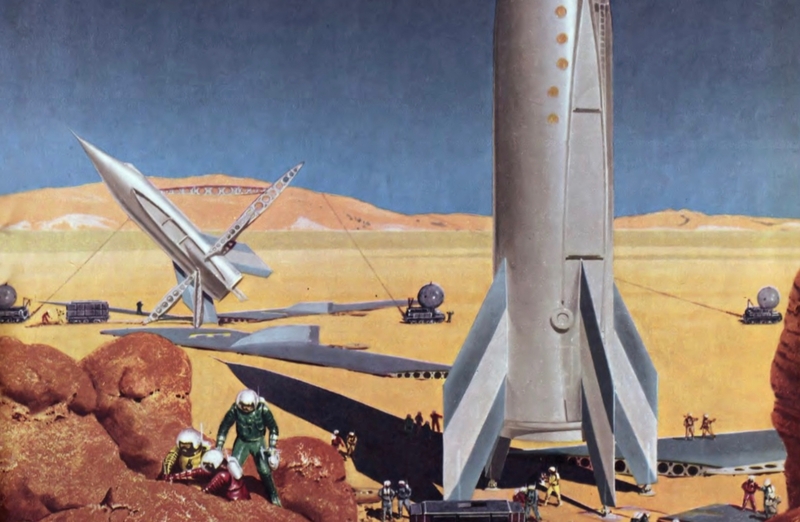 Musk believed that the system’s fully reusable nature would ultimately improve the economics of colonizing Mars by five million percent (i.e., be 50,000 times cheaper than using expendable rockets for the same purpose). The speech garnered reaction worldwide from engineers, scientists, space enthusiasts and the regular public, which was understandable given the ambition of the proposed plans. It was also the first plan to be proposed by the owner of a private rocket company, lending the vision more credibility, since the plan could be done much cheaper than traditional methods. It was a plan that owed its existence to and reflected the decades of prior work done on how best to get humans to Mars. Von Braun Mars Base – via AIAA Horizons magazine. The first person to lay the groundwork for Musk’s speech was the former head of Nazi Germany’s V-2 rocket program, Dr. Wernher von Braun. In 1948, while working for the US Army, he began writing a detailed book called “The Mars Project” in which he laid out how the exploration of Mars might be accomplished. In the plan, von Braun envisioned a fleet of 10 spaceships lifted into orbit by reusable shuttles and powered by engines burning a hypergolic mix of nitric acid and hydrazine propellant. Many other projects for Mars exploration were worked out in the intervening years since then, all of them floundering on the issue of cost. However, in 1990, a new plan by Martin Marietta engineers Robert Zubrin and David Baker took shape. Called “Mars Direct”, it attempted to show that a trip to Mars with current technology would not only be feasible but also cost-effective, a pressing concern given that high cost is what caused Congress to cancel President George H. W. Bush’s Space Exploration Initiative that same year. 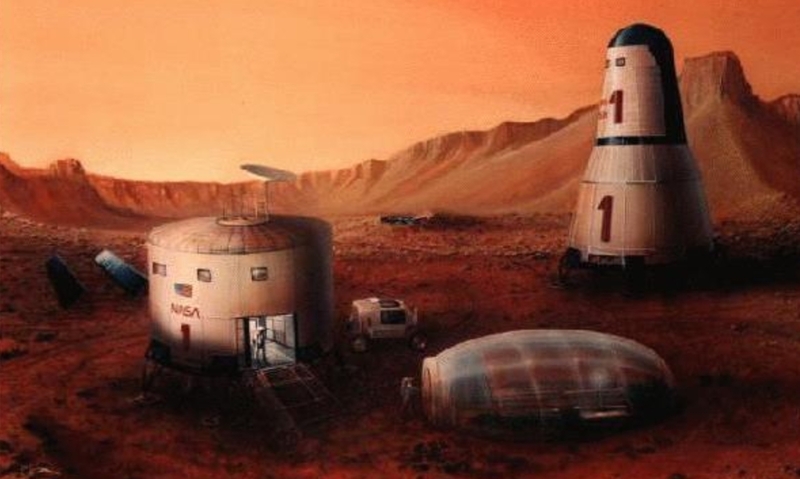 Zubrin’s 12 man team at Martin Marietta envisioned a simple and stripped down strategy for getting to Mars. It envisioned first launching an Earth Return Vehicle (ERV) to Mars via the Ares launch vehicle. The ERV would come equipped with a small nuclear reactor and specialized equipment to produce methane and oxygen propellant on Mars. Once another ERV and Mars Habitat Unit (MHU) were launched to Mars, the original ERV would be refueled. 18 months after landing, it would lift off and return to Earth. The plan called for launching an MHU and ERV to Mars for future missions every 26 months, similar to Musk’s plan.